We advance the computation of physical modal expansions for unsteady incompressible flows. Point of departure is a linearization of the Navier–Stokes equations around its fixed point in a frequency domain formulation. While the most amplified stability eigenmode is readily identified by a power method, the technical challenge is the computation of more damped higher-order eigenmodes. This challenge is addressed by a novel method to compute unstable periodically forced solutions of the linearized Navier–Stokes solution. This method utilizes two key enablers. First, the linear dynamics is transformed by a complex shift of the eigenvalues amplifying the flow response at the given frequency of interest. Second, the growth rate is obtained from an iteration procedure. The method is demonstrated for several wake flows around a circular cylinder, a fluidic pinball, i.e. the wake behind a cluster of cylinders, a wall-mounted cylinder, a sphere and a delta wing. The example of flow control with periodic wake actuation and forced physical modes paves the way for applications of physical modal expansions. 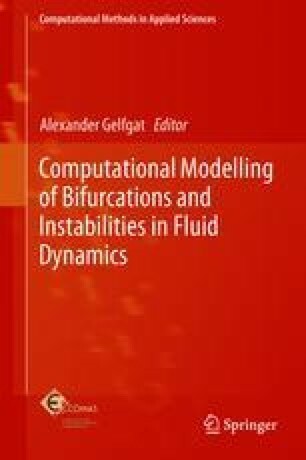 These results encourage Galerkin models of three-dimensional flows utilizing Navier–Stokes based modes. The authors acknowledge support by the Polish National Science Center (NCN) under the Grant No. : DEC-2011/01/B/ST8/07264 and by the Polish National Center for Research and Development under the Grant No. PBS3/B9/34/2015 and travel support of the Bernd Noack Cybernetics Foundation.